Hi friends! Happy Sunday! Please give a warm welcome to first time guest on our blog, Bibi Cameron! You may have seen some of her gorgeous work on our blog hops! I became an instant fan when I saw the beautiful ways she brought our Picture Book French Bulldog to life. (I am biased as I am a proud French Bulldog Momma.) :D You can see this amazing inspiration by clicking HERE. Now onto the amazing inspiration, she made today! Read on and enjoy… it’s a stunner! Hola from Scotland! 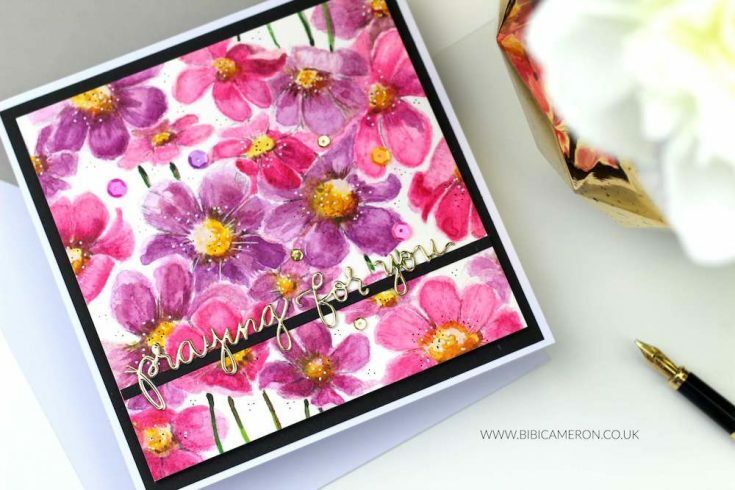 its Bibi Cameron here and I’m thrilled to have the chance to share with you my passion for cardmaking and watercolors! Yay! Since I saw Cosmos Background Stamp I knew it had to be mine!! it was love at first sight as I could imagine myself lost trying to find many ways to add colors to the gorgeous image.So this was my first try, completely inspired by the design of a shampoo bottle with beautiful purple and pink flowers on it. I also use Praying For You wafer die by Simon Says Stamp! Loving the look and feel of the sentiment when using gold mirror cardstock by Tonic Studios. Isn’t it pretty? So all this started with uncertainty… I didn’t know what the outcome might be so I grabbed my Tim Holtz Platform and I stamped the Cosmos image several times on different cardstock colors (even on Vellum). However, the one stamped on watercolor paper caught my attention after seeing how pretty the stamped image looked when I tried to stamp with a contaminated Versafine clear ink pad… It did look clear but also a bit grey… gorgeous! I also used my 36 color set Kuretake Gansai Tambi watercolors. Incredibly affordable and versatile. I like to dilute these paints with water, mixing and blending them with other colors to get new shades. So I started by applying a very light wash of color (loads of water and very little pigment) on dry watercolor paper. Sometimes I allow the paint to dry before applying another wash of color, Other times I apply a new wash of color when the paint is still wet … Or I also use the brush with a little paint (almost dry) on dry paper to create texture and lines. To add shadows I just apply a hint of brown or black paint here and there. I also try to apply lighter colors at the edge of the petals and go darker at the center. I do not pay attention to where the shadows should go and I don’t mind if I get hard lines or cauliflowers. I kind of like a quirky watercolor composition, expontaneous, unprofessional, imperfect but very fun.. every time is something different and unpredictable. I love that! So I put Spanish guitar music on and I enjoyed applying many washes of color to get a highly pigmented tone.Last but not least I added details…. the sentiment, a couple of sequins and using markers I added black and white dots over the flowers. Have you tried watercolors yet? I would really encourage you to give it a try. 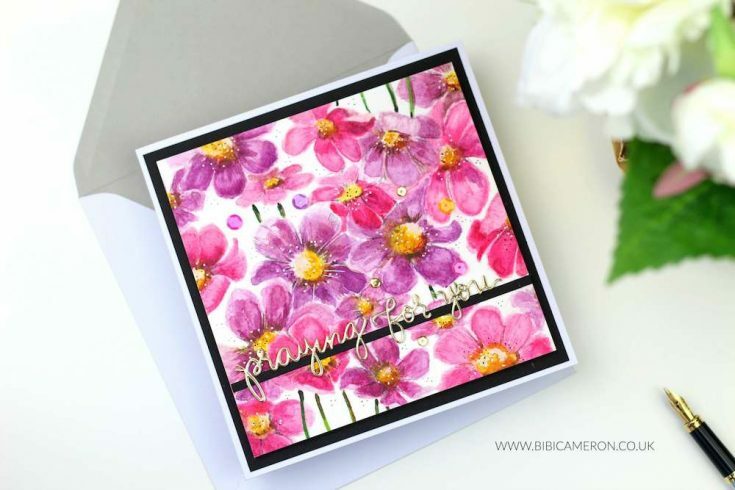 I hope you like my card and a big thanks to Simon Says Stamp Team for having me today. Thanks for reading, and thanks to Bibi for being our guest! This is a cool idea. I know a few people I wold love to give one too. 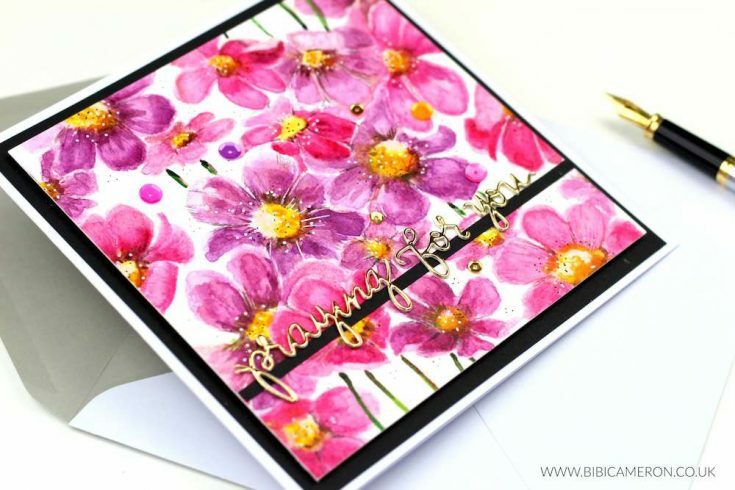 That is just a gorgeous, painterly looking card, and the sentiment looks wonderfully delicate – like a metallic charm. Your card is absolutely gorgeous! Love your colors and you did an incredible job on this. So inspiring! Stunning. It is wonderful to see Bibi as a guest artist. She’s is uber talented. Amazing card; Gorgeous colouring! I fell for Cosmos stamp too and I’m waiting for it to arrive. I will certainly try watercolors with it. 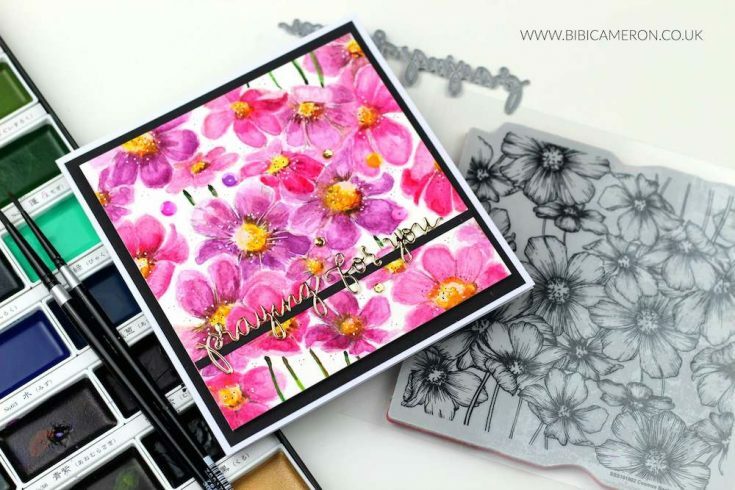 Thank you Bibi for sharing your card and for the inspiration! Beautiful card and coloring! I love the gold sentiment. It looks very elegant. So, So pretty. Thanks for sharing. This is so lovely! I really love this card. 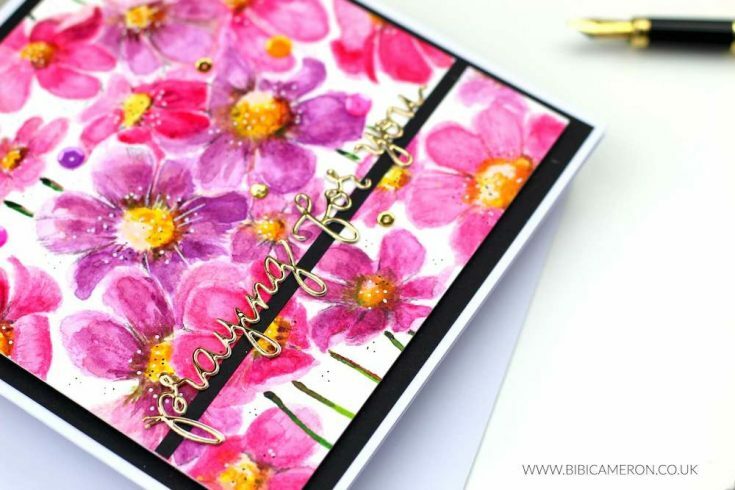 Stunningly beautiful card, love the colouring and the layout and colour combination! Amazing on all the different techniques and results that can be achieved from such a lovely stamp. Thanks for the inspiration! Gorgeous card. Love the colors. Oh, what lovely watercoloring, Bibi. I love your color choices and how vibrant you managed to get this card. Sometimes I think we are afraid of bright color for sympathy or thinking of you cards, but that’s probably when we need some bright colors the most! Thanks for sharing with us. This is stunning. I love the colour palette used for these florals. Oh wow, your Cosmos are sooooo pretty! Love this! Welcome Bibi, Your watercoloring is beautiful and yes I tried it once and it came out awful so I never tried it again, lol. I love your bulldogs you did, I had to check them out because I am a English bulldog mommy, yours were amazing. Thanks for sharing your beautiful card today. Beautiful colors! I like the addition of the dots on the flowers and the sentiment cut from the gold mirror card stock. Wow that background is just stunning!!!!! Wow!! This is gorgeous!! I love this stamp and your coloring is beautiful!! April 2015 Celebrate Blog Hop: Winners!